You’ve grasped the tactics involved with the additional units and weapons from Total Warfare to defeat your opponents. Now you own Technical Readout: 3085 and want to deploy some of those ’Mechs, vehicles, conventional infantry and Land-Air BattleMechs on your gaming table. Grab your dice and start rolling, because these sheets are for you! 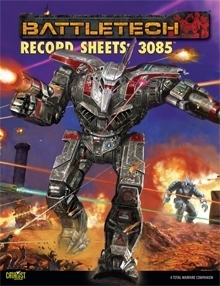 Record Sheets: 3085 contains 71 pre-printed ’Mech record sheets that will have players firing autocannons, missiles and PPCs at each other in no time. More than twenty vehicle and conventional infantry sheets bring the excitement of combined-arms game play to any table top. Two ready-to-play scenarios focus on the highlights of this volume, while an extensive Rules Addendum section provides a sneak peak of all the advanced rules options provided in Tactical Operations. Finally, Land-Air BattleMech Quick-Start Rules allow players to instantly field the three record sheets for these unique, Star League-era units. This title was added to our catalog on July 29, 2010.